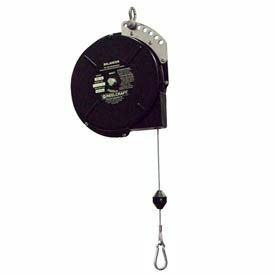 Gleason Reel® Tool Balancers Keep Tools Close-At-Hand In Work Zones. Rugged steel housing with black polyester baked finish. 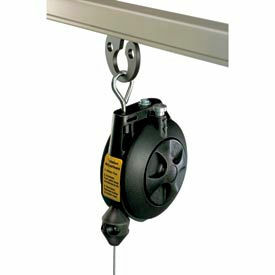 Reinforced hanging bracket with forged clevis allows ceiling mounting and includes holes for safety chain suspension (chain not included). Spring is permanently lubricated and provides constant tension. Spring is adjustable for balancing tool in normal working zone. Cable is tested to 920 lbs. and measures 0.09" diameter and uses 7 x 7 strand galvanized steel aircraft cable that is nylon covered to 0.12" for safety. Includes safety tool clip and adjustable cable stop. Ratchet Lock Retractors include everything above, plus a positive ratchet lock mechanism that allows cable to be locked at a specific height. A slight pull of the cable releases the lock for retraction. Reelcraft™ Tool Balancers Are Used For Keeping Tools Positioned For Immediate Use With Minimal Operator Motion. Tool balancers reduce operator fatigue by keeping tools readily accessible for direct use. Zinc-plated safety latch provides easy and convenient tool attachment. Tool weight is kept in balance, providing a virtually weightless feel. Balancers prevent tools from being accidentally dropped, ensuring added tool safety. Balancers are available in Medium Duty and Heavy Duty configurations.